Workers lay out the red carpet at Mar-a-Lago Club in Palm Beach, Fla., on Dec. 30, 2016. 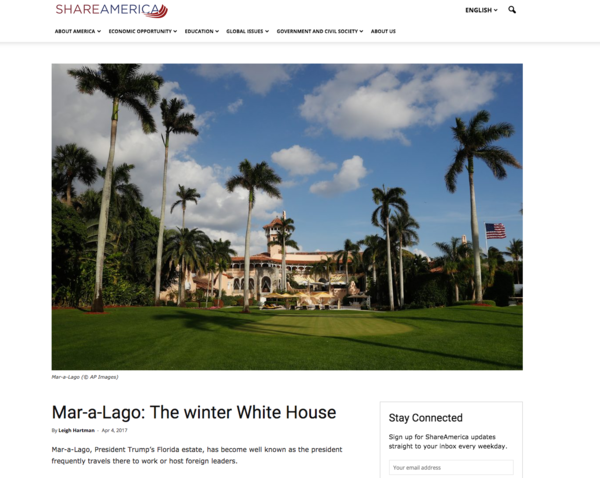 ShareAmerica.gov, a State Department website, shared an article promoting Mar-a-Lago, President Trump's golf club and resort in Palm Beach, Fla. The page has since been removed. An article on a State Department website about President Trump's Mar-a-Lago resort has been removed after criticism that it was an inappropriate use of taxpayer funds. Critics complained that resources were being used to tout the for-profit club, which Trump refers to as the Winter White House. 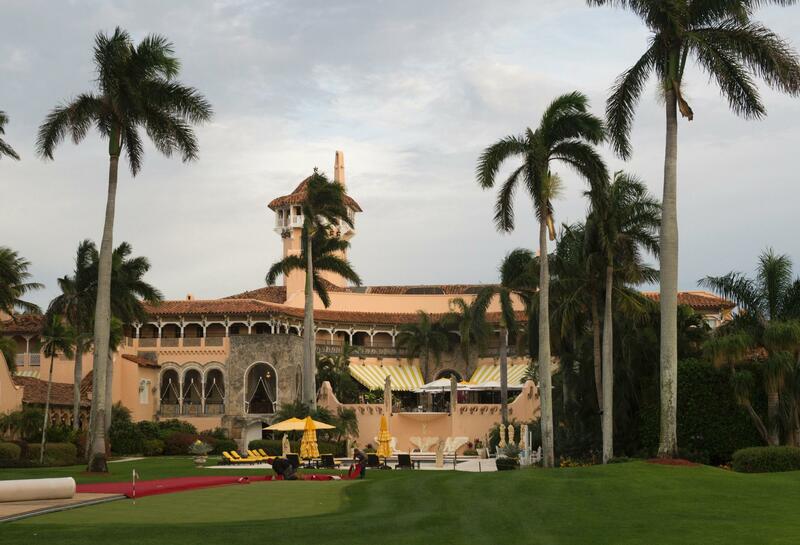 The club, in Palm Beach, Fla., is held in Trump's trust, of which he is the sole beneficiary. "The intention of the article was to inform the public about where the President has been hosting world leaders. We regret any misperception and have removed the post," a State Department official said in a statement that has now replaced the original article. The ShareAmerica website says it "is part of the Bureau of International Information Programs, which works with U.S. embassies and consulates in more than 140 countries to engage with people around the globe on U.S. foreign policy and American society." But on the webpage about Mar-a-Lago, there was no discussion of policy. The page showed photos of the members-only club's opulent rooms and exterior, and noted that "When he acquired the house, Trump also bought the decorations and furnishings that [original owner Marjorie Merriweather] Post had collected over the years, preserving Mar-a-Lago's style and taste." The website generated attention Monday when Sen. Ron Wyden, D-Ore., and others started tweeting about it. In one tweet, Wyden said: "Yes, I am curious @StateDept. Why are taxpayer $$ promoting the President's private country club?" In another tweet, he steered people to the webpage, saying: "Here's the full post in its kleptocratic glory." American Oversight, a watchdog group that includes some lawyers who worked at agencies in the Obama administration, said earlier Monday it would file a complaint with the State Department's inspector general and the Office of Government Ethics. The group says that "promoting Mar-a-Lago appears to violate Section 2635.702 of the Standards of Ethical Conduct, which prohibits government employees from using their public office to endorse private enterprise." American Oversight also had said it would ask congressional oversight committees to conduct an "investigation into how and why the article promoting Trump properties was written and distributed."